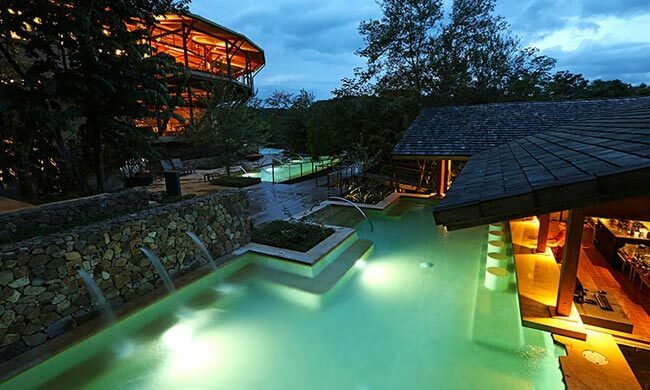 Rio Perdido is an off-the-beaten-track, 32-bedroom boutique hotel situated in the heart of Guanacaste, just an hour and half from the Liberia airport. The hotel is perfect for couples, friends, and families who want to experience the hot springs and zip lining and also want a less touristy destination. Rio Perdido’s lobby, restaurant, and bar area is a beautifully designed open’plan area with views of the mountains and dry forest around you. There are three geothermal pools situated on the property, below the main restaurant area. There is also a suspension bridge on the property that crosses Rio Perdido. The Rio Perdido natural thermal hot spring river is at the bottom of the property, with a nature trail that takes you to enjoy mud bathing. Let the mud dry before soaking in the natural thermal hot spring-fed river, surrounded by the forest. The rooms are free-standing bungalows on stilts nestled in the trees with modern furnishings. Large windows on half of the bungalow give you a view of the tropical dry forest, with a private porch. Each room has a minibar, en suite bathroom, TV set, A/C unit, and a daybed. Local and international calls are complimentary when made from the lobby, as is the WiFi connection. Breakfast is included—a la carte if occupancy is 50 guests or less, or buffet when occupancy is more than 51 guests. This is also a great place for adventure: 15 canyon platforms, five zip line wires, a ten-mile mountain bike, Tarzan swing, river tubing, and miles of hiking trails on the property. The thermally active Miravalles Volcano can be seen from a couple of lookout spots on the property and there is one spot where you can see three volcanoes at the same time!